If you've been paying attention to new CPAP machine features over the last couple of years, you may have noticed a trend toward heated tubes. The trend has been slow and subtle, but devices with heated tubes are now readily available from multiple manufacturers. When the topic of heated tubes comes up, usually our customers ask about the purpose of a heated tube, and whether or not a heated tube is necessary or beneficial. I'll answer those questions here. First, though, we'll look at the history of heated tubes briefly. The first CPAP machines featuring heated tubes were the Fisher & Paykel SleepStyle 600 Series machines with ThermoSmart tubes. The SleepStyle 604 and SleepStyle 608 both had a heated tube. Those models have since been discontinued and have been replaced by the F&P Icon machines which also feature heated tubes. So, F&P has been offering heated tubes for quite a while, since around 2007. With the release of the S9 model line in 2010, ResMed introduced the ClimateLine heated breathing tube. ResMed held a distinct advantage in this area over rival Philips Respironics for two years, until mid-2012 when Philips Respironics released the 60 series REMstar machines. With the release of the 60 Series, Philips Respironics began offering a heated tube option for the new REMstar platform. While ResMed's 2-year head start was noteworthy and could have been used to help ResMed gain some ground on the number one CPAP manufacturer, ResMed never capitalized on it because of pricing issues. While it's true ResMed builds a fantastic product line, it's also true that their products are priced much higher than equivalent products offered by their competitors. It turns out that the heated breathing tube simply wasn't a big enough differentiator for people to choose ResMed over other brands. As it stands in September 2012, there are three model lines with a heated tube option: F&P Icon, ResMed S9, and Philips Respironics REMstar 60 Series. In general, the idea of a heated tube is a pretty good one. A common problem with CPAP humidification is rain-out, or condensation accumulation in the tube. Condensation in a tube is an annoyance for many users, since most people don't like getting splashed in the face with water while they sleep. I know I don't! There are methods for limiting rain-out, including ensuring that there are no low spots in the CPAP tube where water can accumulate (a hose lift comes in handy for this, by the way), and insulating the tube with a tube cover (may I suggest a SnuggleHose hose cover). Another good way to reduce condensation is to increase air temperature, since warmer air can hold more moisture. A warmer tube means more water can be in the tube before condensing into water droplets. Clearly, a heated tube isn't a necessity. It's more of a luxury. A humidifier isn't even necessary at all for some people. According to an unscientific poll conducted on our website, approximately one quarter of CPAP users don't use a humidifier with their CPAP therapy. A humidifier is recommended for CPAP users who feel discomfort due to dryness in the mouth and nose. A humidifier might also be recommended by a supplier who wants to sell a humidifier, regardless of patient need! (I'm sure this happens all the time, with people buying a humidifier not even knowing they have a choice to buy a CPAP machine without a humidifier.) We usually say that if you're on the fence about needing a humidifier, you should get one with your purchase of a CPAP machine because you'll generally save money by buying the flow generator and humidifier together at the same time. However, any humidifier can be added at a later date, so if you buy a device without a humidifier initially, you're never stuck. You always have options later on. With a heated humidifier and heated tube comes an additional power requirement, which may very well be the only downside to a heated tube. The power supplies for the ResMed and Philips Respironics machines are external to the devices, and they're pretty big and bulky. The standard ResMed power supply is a 90 Watt transformer which accommodates both the heated humidifier and heated ClimateLine tube. The power supply for the Philips Respironics REMstar 60 Series is dependent upon which model you buy. If you buy a model with the heated breathing tube (part numbers ending with the TS designation) you'll get the 80 Watt transformer. If you buy a model without the heated tube (part numbers ending in S or HS) then you'll get the 60 Watt transformer. If you buy a ResMed S9 device without humidifier, you can opt for the smaller, lighter 30 Watt power supply since the standard 90 Watt one is overkill. The 90W cord will work with any S9 device configuration, but it's just not necessary unless you have a heated humidifier with heated tube. Since battery use among CPAP users is common, it's worth noting that the power requirement for anything heated - whether it be a heated humidifier, or a heated tube - is substantial, and that you shouldn't expect a CPAP battery to be able to power heated devices for very long. 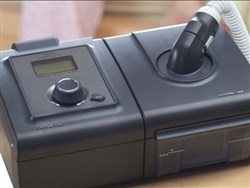 A typical CPAP device by itself will draw about 20 Watts of power. The ResMed S9 and Philips Respironics REMstar 60 Series can both draw up to about 4 times that amount of power, depending on configuration. So battery life would be one quarter (or less) with the operation of heated devices. When using a battery, simply turn your heated devices off and power just the flow generator. If you happen to be in the market for a new CPAP machine with humidifier, I'd highly recommend considering a heated tube option. You can hardly go wrong with one, and it's a fairly affordable luxury. Heated tubes help minimize condensation in the CPAP tube. Fewer disturbances caused by water in the CPAP mask during sleep. Not necessary, but a good feature if you tend to need higher humidity levels to be comfortable. Personal Preference - Do You Have Issues with Condensation? Platform - Does Your Existing Platform Support a Heated Tube, Or Would You Need to Buy a New CPAP Machine? There you have it. Some information on getting up to speed with current heated tube options. If you still have any questions about this type of feature, or about any features on any CPAP machine models, we'd be more than happy to help you. Just click to contact us any time.